"Offset crossings," which the city piloted last year, may become more common on the city's protected bike lane routes. DOT's first offset crossing on Columbus and West 70th Street. You may be safer than you think. A city intersection design that’s much reviled by cyclists because it forces them out of protected lanes and into a “mixing zone” with fast-moving cars remains one of the safest ways to deal with crossroads, a new Department of Transportation study reveals. At the same time, a promising, Dutch-inspired intersection design that cyclists feel more comfortable about has flaws that will require tweaks before being rolled out widely, the city also discovered. It’s all part of “Cycling at a Crossroads” [PDF], a detailed analysis of intersections of car lanes and protected bike paths, a persistent challenge for planners. Certainly, protected bike lanes have proven to be a life-saver all over the city — so safe, in fact, that almost all of the entire remaining safety challenge for them is at intersections, where 97 percent of collisions occur. The study is part of an effort by the DOT to fix that problem — an initiative that dates back to April, 2017, when a truck driver turned into and killed 31-year-old Kelly Hurley, as she cycled in the First Avenue protected lane. After that death, DOT created something called “offset crossings,” a type of semi-protected intersection, and installed them at West 70th Street and Columbus Avenue and West 85th Street and Amsterdam Avenue. Such intersections seek to reduce conflict between motorists and cyclists by forcing drivers to slow down to make a sharp turn that puts passing bike riders directly in front of them rather than over their left shoulders. 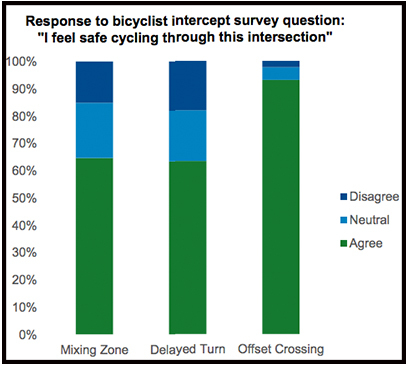 The DOT says that 93 percent of cyclists feel comfortable in such intersections — versus 65 percent at “mixing zone” intersections — but the study revealed flaws in the design. For one thing, “Drivers are turning at a higher speed than preferred leading to short reaction times and more potential crashes,” the report says. Also important: the design seems to be tricking bicyclists into thinking they must yield to the driver. Such intersections will likely be tweaked before they are rolled out widely, the report says. In the meantime, the study suggests that DOT continue to improve mixing zone intersections, which requires cyclists and drivers to navigate shared space. Many cyclists say they feel terrified in mixing zones — and such intersections had the highest rate of serious conflicts between drivers and cyclists, who sometimes go straight and sometimes veer around cars — but statistics show they have become safer in some key ways. DOT has started shrinking the size of the mixing zone itself, and partly as a result, mixing zones have 30 percent fewer cyclist injuries than an intersection design called “fully split phase” — which gives cyclists and drivers their own red, yellow and green signals. At a fully split phase intersection, cyclists get their own green light before they stop and cars can go. “The higher crash rate at fully split phase locations may be partially explained by risky behavioral issues such as red-light running [when drivers have the green light],” the report said. Also, this particular design is often used at higher-risk locations — where mixing zones might perform even worse. The biggest problem? No matter what intersection design, large majorities of cyclists in protected bike lanes say they don’t know which vehicle has the right of way at intersections. In a mixing zone, only 36 percent of cyclists said they knew who must yield. In an offset crossing, that rises to 42 percent — still far too low for DOT comfort. 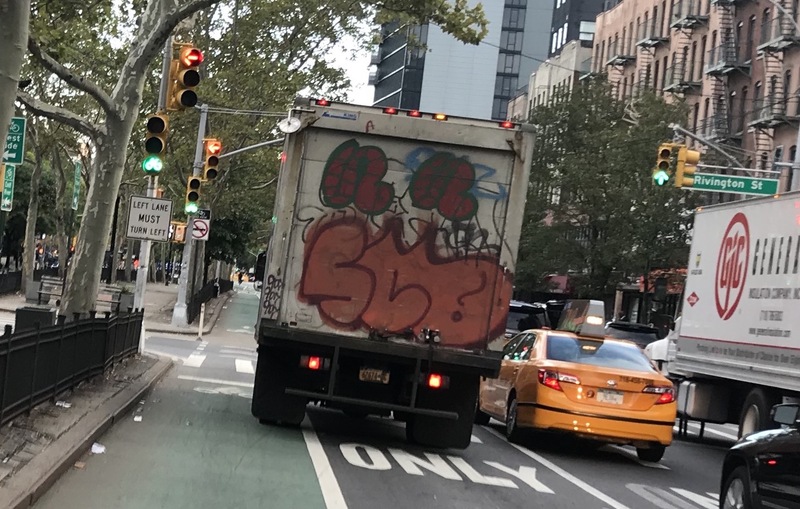 Dude you sure do love you some First Ave bike lane at 42nd st. Personally I dread it. Cars go fast there (34th st and up is already a fast-driving portion of the avenue) and I don’t enjoy threading that needle between the two lanes. And not many peds in that crosswalk to slow drivers down. I do dig that segment of First Avenue. I find that I can more easily make myself seen in the relatively orderly mid-block travel on the way to 42nd Street than I can in the bustle and confusion of the typical intersection. And when the flaws of various configurations are weighed against one another, we should be able to see that cyclists fare better in the configuration found at First Avenue and 42nd Street (a straightaway requiring a simple lane change) than in a configuration that requires cyclists to deal with turning drivers who at that moment are not paying attention to them. This is not an apples-to-apples comparison. You are comparing some hypothetical way that a cattle-chute bike lane could work to the way that a mixing lane conflict does work. Anyone who rides in this city (other than you) ought to feel perfectly terrified in a cattle-chute lane like the one you extol. A mixing lane conflict at least requires us to pay attention to only one lane of traffic; in a cattle-chute lane, we have to watch two lanes for inattentive drivers. But: “this isn’t Europe.” Obviously the laws of physics and spatial geometry work different over there. Ride super-defensively, yes. But don’t act as though you are invisible. Make yourself visible; use sound and demonstrative gestures to become seen; definitely use lights at night. -Take the lane when appropriate, but pay attention to cars coming up from behind and be ready to veer towards the curb if they are going to overrun you. -When you think a car is going to right hook you, be ready to turn right with that car rather than going straight into the hook. Some call this the most coveted of the coveted Streetsie Awards. 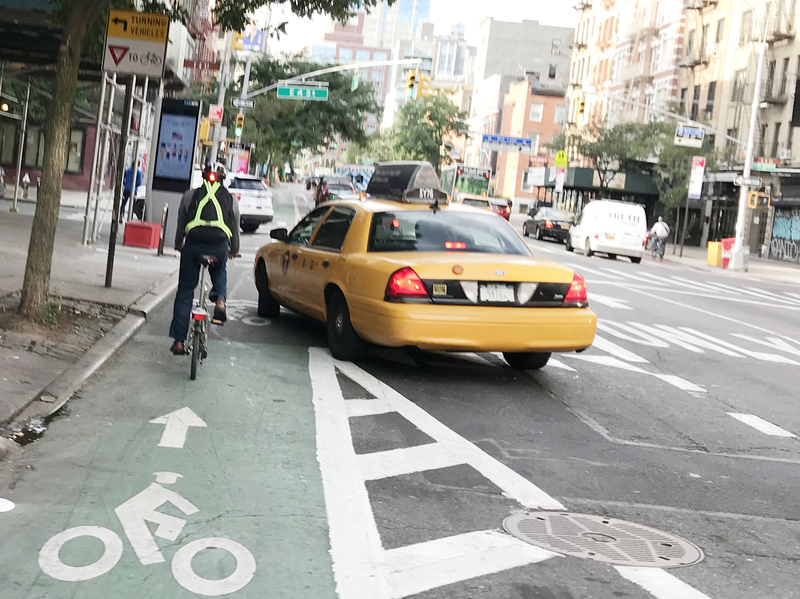 The Manhattan Community Board 4 transportation committee unanimously endorsed DOT's plan for crosstown protected bikes lanes on 26th Street and 29th Street last night. The redesign calls for a five-foot parking-protected bike lane with a two-foot buffer on most blocks, with variations where the street is wider or narrower. When it was built at the turn of the 20th Century, the Grand Concourse was envisioned as the Bronx’s Champs Elysées. But generations of car-oriented development have reduced the Concourse to a speedway for motor vehicle traffic, despite low rates of car ownership in the neighborhoods that surround it.